The Food and Drugs Authority (FDA) has disposed of 25 cartons of adulterated cosmetic products which poses danger to the health of users. 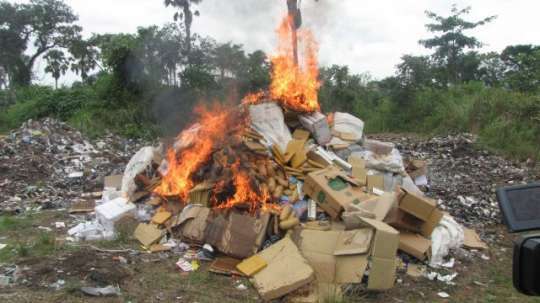 The dangerous products were set ablaze at the Nsumia Landfill site, near Nsawam, in the Eastern Region under the supervision of a team of officers from the FDA. Addressing the press at the end of the exercise, the Chief Executive Officer of the FDA, Mrs Delese A. A. Darko, explained that those products were adulterated with either mercury, hydroquinone or steroids, which could have adverse effects on the consumer. The FDA in a statement has equally instructed the producers of the harmful cosmetics products to recall them from the market. The latest development is as a result of an investigation conducted by the FDA on the Ghanaian market which revealed that the cosmetic products contain some harmful substances which violate the Standards Authority Act, 1973 (N.R.C.D.1 173) as well as sections 111 (c) and 113 (b) of the Public Health Act, 2012, Act 851.